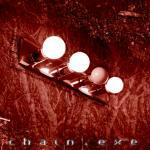 Chain is a progressive rock/metal band that was formed by German keyboardist Stephan Kernbach in 1995. Its original line-up consisted of Stephan Kernbach, Henning Pauly (guitars), CHRISTIAN BECKER (bass) and Thorsten Hannig (drums). They rehearsed for a full year without a vocalist and then broke up because no suitable frontman could be found. In 2002 Henning re-discovered the material that was recorded in the practice room during a rehearsal. The recording that was made with only a single mic was good enough so that he could sit down and figure out the parts and he got to work on re-working the songs and recording them in his California studio. He left his former bandmates in the dark about this in order to surprise them when he was going to visit his parents the following christmas. Once all the music was recorded he employed the services of his friend, the songwriter Matt Cash who became Chain's long missing frontman. Henning burned 10 copies of the CD, printed some booklets and headed home for christmas where the CD indeed surprised his old friends and revived old friendships. None of them knew, Henning included, that anyone but them would be interested in this music. Well, ProgRock Records was and offered them a deal which would lead to far more than just selling Reconstruct. Their second album chain.exe has special guest performances by Saga's vocalist Michael Sadler (who is singing the classic Saga song Hot to Cold), Mike Keneally (who does a guitar solo and sings on Last Chance to See), TSO's Jody Ashworth, Steve Katsikas (saxophone solo on Cities), sean andrews (stunt bass on Eama Hut), Victoria Trevithick, Maya Haddi and Edward Heppenstall. The band's first drummer Thorsten Hannig was not interested in continuing to work in progressive rock so the drums are now recorded by Eddie Marvin (Henning's brother). They currently have no plan on doing any live gigs. Stephan Kernbach and Christian Baker are currently members of the German progressive group Transmission, Henning Pauly has several projects going on, including Frameshift (featuring guest vocalists James LaBrie and Sebastian Bach) and his solo albums and Matt Cash also has solo albums to his credit.